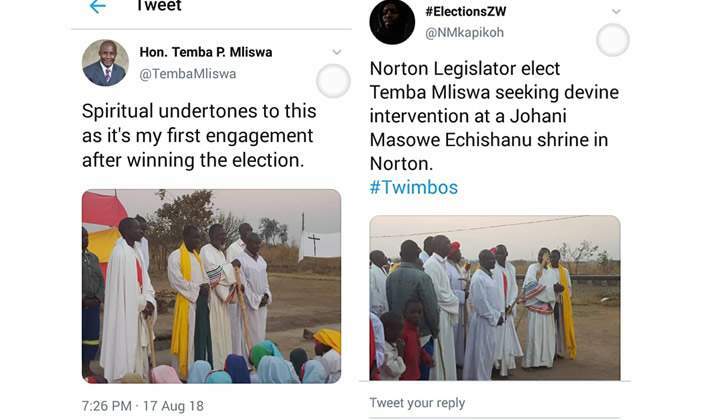 Norton Legislator elect Temba Mliswa has come under attack on Twitter after sharing a photo of himself at a Johane Masowe shrine clad in white garments. Mliswa did not hide his visit as he also posted his picture among vapositoro saying, "Spiritual undertones to this as it's my first engagement after winning the election." The move have been seen by many Twitter users as a desperate measure to gain Ministerial post in Mnangagwa's regime. "The Ministerial campaign has reached pitch.You badly need it and the vaPositorimust now help you,"tweeted a user Withus Masunda. Another user identified as New Generation said, "Kuda kuita minister kwakashata ana Temba wakuendavokunoshandirwa…..Zanu politricks." Some users said Mliswa needed real God not vapositori in his life. "Your lips need real Christ my Man and your heart needs God…,"said Sir Norman Tawarwisa. Obeybhuga tweeted, "Jesus heyyy woo came see this one…"
However, senior ZANU PF officials are in the habit of visiting vapositori during election time with the recent incident of the funeral of Johane Masowe eChishanu Vadzidzi vaJesu church founder Aron Mhukuta commonly known as Madzibaba Wimbo who died last month. The funeral was attended by ZANU PF politiburo member Perence Shiri together with Minister of state for Mashonaland Central advocate Martin Dinha clad in garments.